DUET around the southern lagoon. We haven’t moved very far from Noumea although we have explored the southern lagoon pretty thoroughly. The winds have been either very light or there is a sudden change to howling gales and pouring rain. We have had friends coming and going every couple of weeks or so returning to the big city of Noumea every so often to top up with essentials such as French Cheese and pates has become something of a routine. 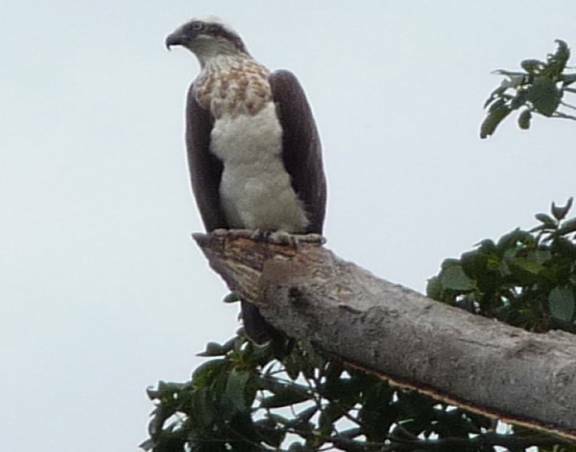 The Osprey, or sea eagle, are as common as pigeons in New Caledonia. Almost every dead branch has one on look out duty. They are fiercely territorial and are frequently seen chasing another bird out of their patch. This one was happy to pose for us. Osprey are as common as pigeons in New Caledonia. 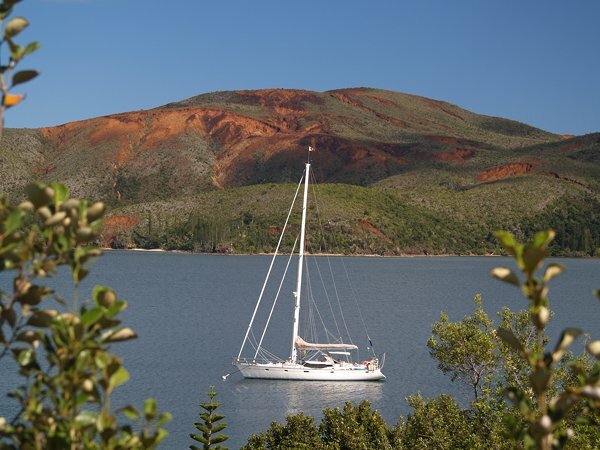 New Caledonia is rich in minerals and produces 60,000 tonnes of nickel and cobalt per year. The soil varies in colour from deepest alizarin crimson through to various shades of rich iron red. The landscape is scarred and bloodied by mining and erosion. New Caledonia has an incredible variety of flora and fauna many of which are endemic. It’s a botanist heaven. 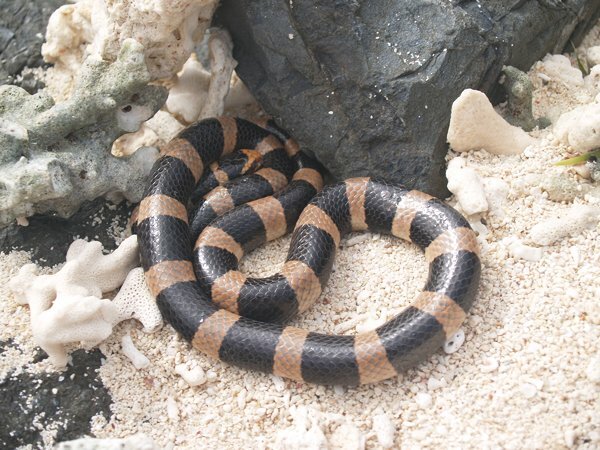 Whilst wandering along the beach or snorkelling on the reef you will almost certainly come across one of these handsome snakes. This is the three banded Krait locally known as le tricot rai. Their venom is extremely poisonous but as their mouths are tiny you run little risk of being bitten. Under water they appear to be more blue and white. In 1998 the Tjibaou Cultural centre was opened. 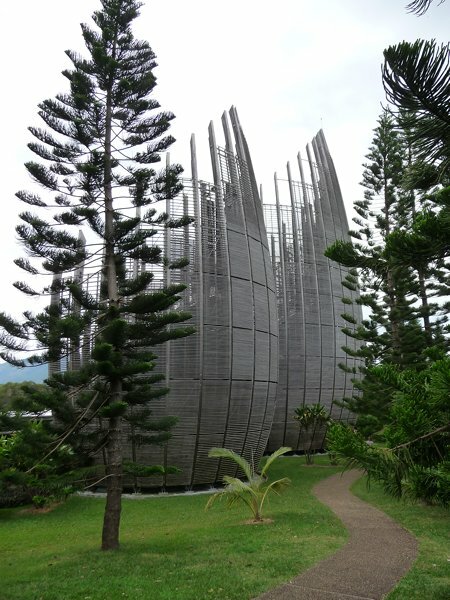 The architect is the well known Italian Renzo Piano designer of the Pompidou centre amongst other famous buildings. When crocs, those extraordinary-looking mini-mouse like sandals first appeared on the scene I thought they were the ugliest form of foot wear I’d ever clapped eyes. 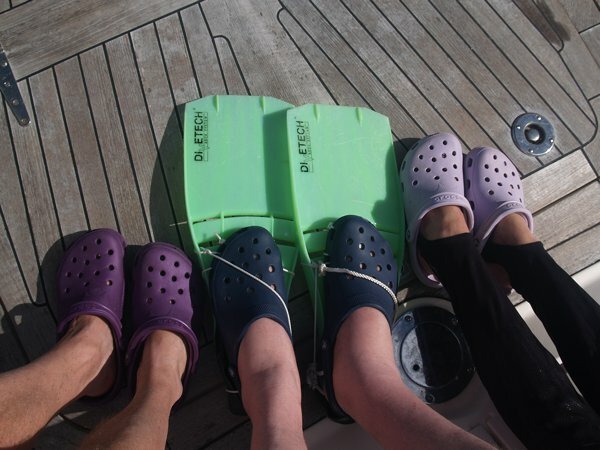 Even if they were highly praised by reliable and good friends to be the most comfortable and the most practical form of boating footwear, I said not on your life, and declared Duet a Croc free zone. Nevertheless one is allowed to change ones mind. Like all newly converted I am now their greatest fan. I still consider them to be ugly but they do come in terrific colours and are more adaptable than I’d ever given them credit for. A friend came to stay and couldn’t squeeze his feet into our fins. But he had his own pair of crocs……..nothing daunted Simon, the Master fixit adapted the crocs to the fins – and we snorkelled happily ever after.